To bring back the leg while crossing in front of the leg which is in support. 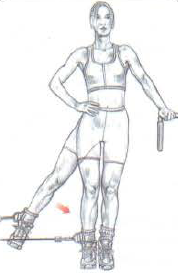 This exercise works all the adductors muscles (pectineus, adductor longus, adductor magnus and gracilis). This exercise is good for defining the inside of the thighs and do it with high reps.